I prepared this post for you as a pedagogue, MA in physical education, a coach and a traditional karate contestant. It will be useful for parents of kids of all ages, and those of you who have no children will surely find some interesting facts here, too! In Poland there will be 400.000 overweight children more every year, including 80.000 with obesity. Fast food, lack of awareness in the field of healthy nutrition and of the impact of emotions on behaviour connected with eating, life under pressure and in a hurry, no physical activity – there are many reasons for such disturbing statistics. Therefore, it’s high time we started acting now to prevent the spread of obesity epidemic in the future. Research shows that few parents are aware of their kid being overweight. Statistics don’t lie. Children of obese parents have up to 70% likelihood that they will also be obese. However, when parents are slim, their kids’ risk of being overweight amounts to only 10%. Children learn various habits, including healthy ones by modelling. This means that our sweethearts emulate their parents’ behaviour in every way – their attitude to sport, regularity of meals, food preferences, etc. So…be a role model for your child! 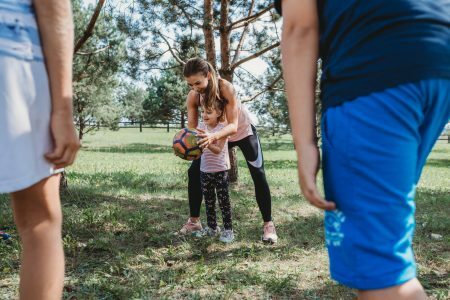 Lots of studies have shown that parents’ active involvement in their children’s behavioural changes had significantly better and more long-lasting effects. What’s more, doing sport together and setting a good nutritional example improves the parent-child relationship. Do you know that shaping taste preferences begins in the mother’s womb? That’s why it’s worth taking care of your baby’s healthy habits while you’re pregnant. It’s also important to develop the habit of practising sport in our child. I encourage you to run with a pram or a stroller. As a result you will stay active, your child will enjoy active walks and he/she will get used to physical activity from an early age. Playing games is the best way to get our kids involved. Remember tag? Or picking mushrooms? Dancing to the music? Karate training, even just for fun, not serious? Running in the backyard? In times of smartphones and internet we must pay special attention to physical activity. Try to make it interesting and inspiring for your children. They will always choose the activities that are simply pleasant as it’s natural for every human being to seek easy and … pleasant solutions 🙂 Every run can turn into a treasure hunt, and ordinary frisbee throws can be replaced with aiming at certain targets. Words matter. But only when the same actions are behind them. If you want to teach your child to follow a healthy diet while drinking cola with your dinner then remember that your child will first of all react to your behaviour, not to your words. That’s why, if you want physical activity to be natural, your child must see that it’s fun for you, too. Don’t choose activities you don’t enjoy as you will not be consistent and your children will immediately spot lack of authenticity. As a new mom I have clapped my hands smiling at every new thing my daughter does. As a coach, while training with kids I always showed everyone what they were good at, praised them and promised rewards for good results. Look for resources in your children, see what they can do, what they’re good at and what they’ve achieved so far. And then you can say what they need to work on a bit more. This approach will surely motivate your children to work hard! Let this topic appear in your life on a regular basis. When your child comes back from the training, ask him/her: How was it? What did you like best? Did you have fun doing the warm-up with others? What have you learned? Make sure you share these observations with your child so that they know this topic is important in your family life. Point to the benefits of physical activity. 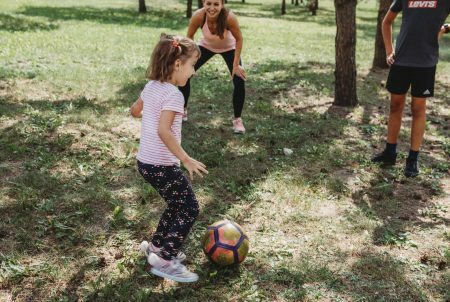 Children who do sport not only stand a lower risk of developing civilisation diseases, but also lots of research shows that they memorise faster, have better results in cognitive tests and need less time for revision. Moreover, sport makes children aware of their efficiency, it helps to learn self-discipline and to deal with difficulties and challenges, or even to accept defeat. Did you know that successful athletes usually have the same character traits as the best managers? We all had some heroes in our childhood. Boys in the gym tightened their muscles to be like Arnold Schwarzenegger, others wanted to play basketball like Michael Jordan, and so on. Make sure your child has a hero, too, as this will make him/her more willing to do sport! Sport is fun, sport is healthy, sport is necessary. 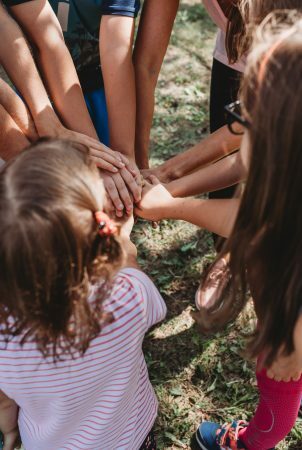 It’s not for the child to satisfy the parents’ ambition but it’s a way for personal fulfillment, learning teamwork, gaining strength and determination. And those are the areas in which we should help our children excel. Lopes L, Santos R, Pereira B, Lopes V. Maternal perceptions of children’s weight status. Child Care Health Dev. 2013 Sep;39(5):728-36. Stewart L, Chapple J, Hughes AR, Poustie V, Reilly JJ. The use of behavioural change techniques in the treatment of paediatric obesity: qualitative evaluation of parental perspectives on treatment. J Hum Nutr Diet. 2008 Oct;21(5):464-73. Warming products, must have for the winter! Breakfast that will put you back on your feet! Intestines are a set of tubes several meters long, the insides of which are composed of villi covered with projections – the way they are built increases their surface area for the absorption of substances several times. Plan healthy! Something for readers NOT ONLY ABOVE 50 YEARS OLD. Something for readers NOT ONLY ABOVE 50 YEARS OLD. It’s time to start talking about this difficult issue. The world we live in is for many the world of living in a hurry, competition and multitasking.